Exciting, thought-provoking, intelligent — who knew the Whitechapel’s geometric abstractions would be such fun? Foolish or heroic? 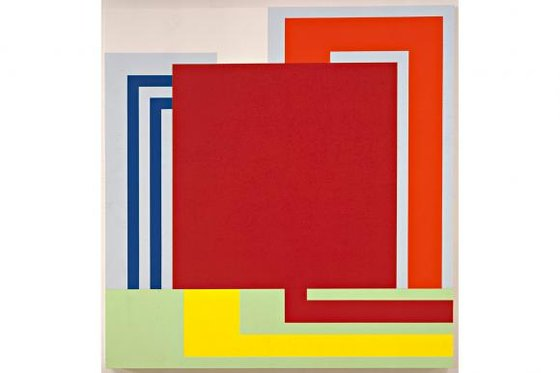 Was it silly of the Whitechapel Gallery to attempt to encapsulate 100 years of geometric abstraction from around the world by cramming 100 artists into London’s most higgledy-piggledy exhibition spaces? Or was it plucky, ambitious, ballsy? Reader, I was of the first opinion before I went in. And the opening glimpses of the show, with scores of geometric artworks coming at you from all sides, seemed to confirm the impossibility of it all. It was like being pelted with Rubik’s Cubes. A hundred international artists, with a zillion international agendas, crammed into the Whitechapel? That cannot possibly work, can it? Actually, it can. Adventures of the Black Square isn’t just a survey of any old geometric abstraction. 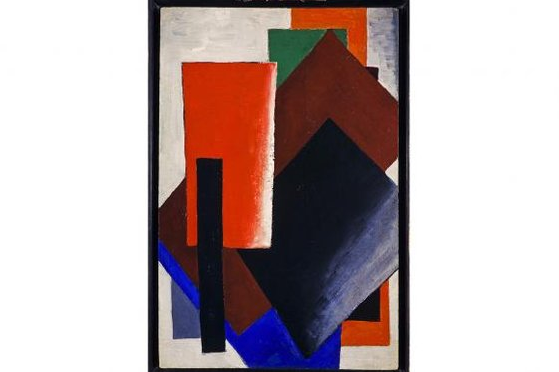 Its specific target is the art prompted by the most notorious of all examples of geometric abstraction: the Black Square exhibited by Kazimir Malevich in Petrograd in 1915. If you saw the Malevich show at Tate Modern last year — it was wonderful stuff — you will know already how Malevich took art back to ground zero by painting a black square on a white background. And that’s it. 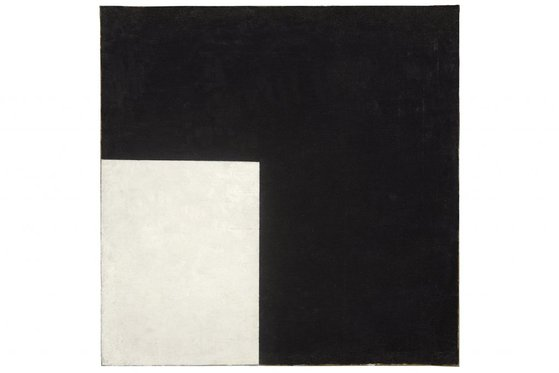 One thing the Tate show proved was how much heft and power there was to the Black Square. Instead of suggesting nothing, it seemed, rather, to suggest everything. And if anyone out there is thinking me silly for finding power in an expanse of black, allow me five words of defence; red. Tower of London. Poppies. The present event has neither the time nor the space to consider these kinds of colorific issues in any depth. All it can do is fire things at you. Lots of them. The first Black Square you encounter, the one setting the show’s agenda, is tiny, a diddy little thing not much bigger than a postcard. It is followed by two more Malevich squares, an even smaller red one, the size of a postage stamp, and a larger 1915 painting of a white rectangle on a black canvas. All three jab you with the same message: here is art that looks as if it is saying nothing, but feels as if it is saying everything. Malevich is surrounded by a clutch of other Russian pioneers — Popova, Klutsis, Rodchenko — all of whom use geometry to evoke the revolutionary rhythms of the modern age. In the minds of these history-bashing Soviet futurists, the art of the 20th century should be clean, thrusting, spick-and-span. In the new world order, there was no room for organic blobs or inchoate oozings. If the past was a steak, the future was a knife. What the world needed now was the hygiene of geometry. That, at least, was the theory. In the flesh, in the art itself, nobody quite pulls it off. The diddy Malevich squares, the gorgeous eruption of painted rectangles by Popova, even Rodchenko’s early photographs of madly diagonal radio masts, have an enchanting wonkiness to them. This was supposed to be super-pure geometry, but what actually came out was fragile and human. The little red square by Malevich is so tiny, you want to put it in a matchbox and protect it. Nowhere in this show, and particularly not at the start, does the geometry feel blank. The busyness of the display turns out to be atmospherically accurate as well. If you look at photographs of those first suprematist exhibitions in which Malevich unveiled his revolutionary Black Square, you will see that they were packed to the ceiling. A Tatlin here. An El Lissitzky there. A Malevich up by the roof. Another observation prompted by this busy opening is that the Black Square, in this context, is fiercely reminiscent of the Kaaba, the perfect black cube in Mecca that is the centre of the Islamic hajj. In early diagrammatic maps, the surrounding forces seem to be being pulled irresistibly towards the black square at their centre. It’s precisely what happens here. Given Malevich’s interest in various forms of non-European spirituality, my prediction is that one day someone will prove he came across diagrams of the Kaaba, and that the Islamic proscription against figures was a key inspiration for him. Having jabbed you with Malevich and the suprematists, the display goes on to jab you with all the other early groupings who turned to geometric abstraction in the pioneering years of modernism: Mondrian and the De Stijl artists; the Bauhaus; Fernand Léger and the mechanised ballet; the Polish constructivists Kobro and Strzeminski. We see not only paintings by them, but also photos, sculptures, wall hangings, manifestos, films, posters and magazines. The art may strive for emptiness, but the surrounding chatter doesn’t half go on. With so much to look at and read, with space at such a premium, it was strong of the organisers to clear the decks at the end of the downstairs gallery and lavish some emptiness on American minimalism. A huge lead floor piece by Carl Andre and a glowing neon tower by Dan Flavin create a piazza of stillness in an experience that otherwise jumps about from roof to roof like the opening of a Bond movie. The American minimalists are here because one of the show’s best ambitions is to reveal how widely geometric abstraction shook the world in the 100 years that separate us from Malevich. Among the 100 artists crammed into the display are pioneering strangers from Argentina, Brazil, Peru, Mexico. Geometric abstraction is obviously the Esperanto of art styles. While the downstairs gallery takes the history of geometric abstraction as far as the 1960s, the upstairs gallery has the easier task of picking through more recent developments. Easier because we are dealing now with individual artists, rather than national schools and group manifestos, so the tricky business of encapsulation can be avoided. These days, geometric abstraction can be seen painted onto the sides of the Peruvian lorries photographed wittily by Armando Andrade Tudela; in the gorgeous blue patchwork rugs designed by Chant Avedissian, from Cairo; in the red rectangles moving across the black-and-white films of Karthik Pandian, from LA; or in the delicate sculptural mappings of Amalia Picam from Argentina. If the first half of the show is an overcrowded history of art’s past, the second half is an overcrowded lucky dip of contemporary wilfulness. To its credit, the display recognises this difference. Indeed, the crumbling of utopian dreams and shared ambitions, the shift from our-generation art to me-generation art, is an important part of the story we are being told. Well done, the Whitechapel. To have created a coherent narrative from this many bits is a special achievement. Heroic? Maybe not. Exciting, thought-provoking, intelligent, informative and fun? Definitely. « All good, clean fun?